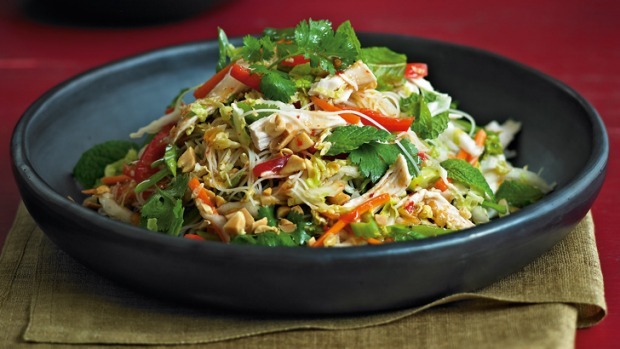 Vietnamese chicken and noodle salad. Chinese cabbage is elongated in shape with a crisp, crinkly, pale-green leaf. 1. Put 1 litre water and the kaffir lime leaves in a medium saucepan over medium–high heat. Bring to the boil, then reduce the heat to a simmer. Add the chicken, cover and simmer for 8–10 minutes or until the chicken is just cooked through. Remove from the heat and leave the chicken in the poaching liquid for 10 minutes. Drain. Use two forks to coarsely shred the chicken. 2. Put the noodles in a heatproof bowl. Cover with boiling water and set aside for 2–3 minutes or until tender. Drain. Rinse under cold water, and drain. 3. To make the chilli dressing, put the sauces, lime juice, oil and garlic in a small bowl and whisk until well combined. 4. Combine the capsicum, carrot, snow peas, Chinese cabbage, spring onions, bean sprouts, half the herbs, the noodles and chicken in a large bowl. Drizzle with the dressing and toss to combine. Serve the salad sprinkled with the remaining herbs and the nuts.